Also at the farmer's market I saw some amazing avocados. I start drooling just thinking about the sandwich I got at Veggie Star made with a local avocado. Dare I say epic? My last full day in Hawaii most people were heading home, so I took off on my own. I rented a car to drive to Kailua Bay so I could rent a kayak so I could paddle to the Manana and the Molokua Islands. First I stopped for lunch at Down to Earth (mmm, vegan potato salad and a hummus & mock chicken wrap). Behind the parking lot was a stream filled with Common Moorhens and Hawaiian Coots! The stream was full of fishies too! 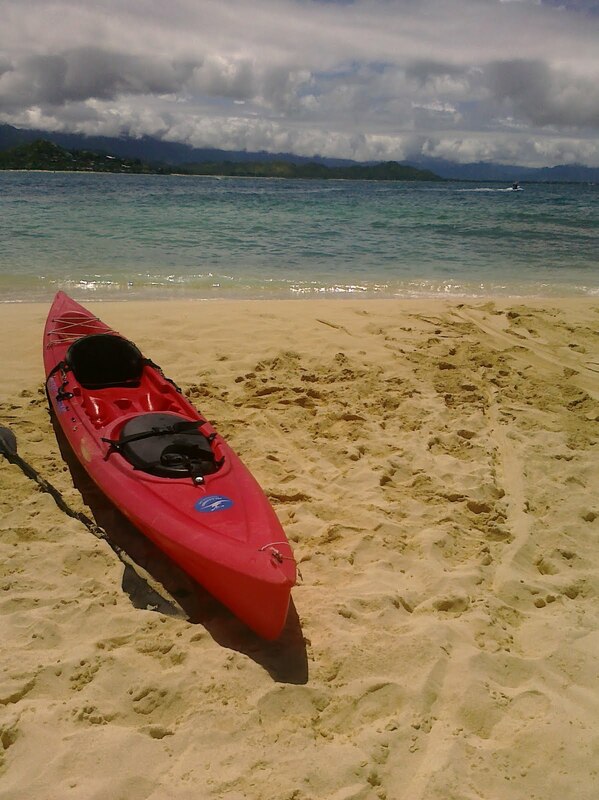 I made it down to the Kailua Beach park and met up with my kayak. It was probably the most beautiful beach and water I have ever seen. On Manana Island a shearwater let me get great looks as it flew around the island, eventually settling down. I didn't realize till after that it had settled down to sit on an egg. Also on Manana Island were lots of anole lizards! Alright, I'm almost done. The last interesting creatures I saw in Hawaii were mountain goats! I had no idea there were mountain goats there, and I didn't get very good photos, but still. Cool. The only bird I saw and didn't get a photo of was a Great Frigatebird. I watched one soaring by Diamond Head when I was in a car on the highway with my camera in the trunk. Still awesome to see. And that was it! Now it's time for camping! Awesome photos of the birds of Hawaii. The shearwater are cool. And I love the sunset. I've been there four times and each time I was not into birding. Now, I have to go back again. I really enjoyed all your photos. Dude...way to meet the Wedgies and White Terns...they are real class acts. I got my lifer Frigate in Hawaii too! Love that place, great posts! Awesome pic of the Golden Plover. I would have given anything to do that paddle with you. I'm thinking of paddling out to South Island in Chatham this weekend. Should be tons of shorebirds. Glad you had a great time. My goodness, what a trip! Those sheep are surprising- did someone import them? Thanks for sharing pics of what looks like a wonderful trip!